Wayne's furious that he didn't stop the drag race. Lauren tries to re-assure him but Wayne says it's confirmed that he's not cut out for the job. Rupert Sprod is hassling Rick for details of how Briggs died. Michael squares up to him and pushes him away. After the fire at Lassiters, Cheryl tells Philip that maybe he should get police protection. Philip spies a photo of Cheryl on the back of the office door with a knife through it and says that she might need it more. Rick's wishing everything would end and isn't sure about the idea of a memorial service. Cody thinks it's a good idea, so that they can all deal with it and move on. Debbie joins them and tells them that she's been asked to deliver the eulogy. She's worried about it but Cody reckons she'll do it well. Helen trails off and hands the letter to Wayne for him to read the rest himself. Wayne observes that excruitiating is spelt incorrectly but otherwise, there's little clue to who the culprit maybe. Cheryl's insistent that they must found out who's responsible but Philip's convinced that it's one of the sacked laundry workers. They discuss who it could've been but Philip warns against starting another witch hunt as they don't want anymore bad feeling within the staff. Philip hopes that whoever it is feels that they made their point and now they'll leave them alone. Worriedly, Cheryl picks up the photo which had the knife through it and says that the numbskull who did it might have other ideas. Philip says they should keep a sharp lookout but lay off - but Cheryl wants to get the police involved. PHILIP: I think you're overreacting. CHERYL: Oh Philip, easy for you to say - it's not your photo that's been knifed! Michael bowls Brett out but Brett doesn't share in the jubilation, saying that he's not good enough. Michael says that if he's not good enough, how come he's on the team? Brett points out that the only reason is because Briggs is out forever. 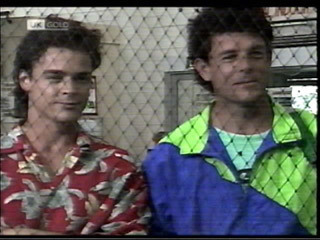 Michael points out he was good in the father/son match but Brett says that was only because Cheryl was screaming at him. Michael threatens to bring her along as their secret weapon but Brett tells him to not even joke about it! Wayne strolls over and Michael tells him about Brett's worries. Wayne tells them that he's resigned from Erinsborough High so they'll have a new cricket coach. Michael calls him back to thank him for everything - and Wayne warns them that they should never hit teachers like he did..not even the old cranky ones. Michael and Helen are discussing Wayne's resignation and how much of a waste it was. Philip walks in with the threatening letter and Hannah and Debbie. Philip suggests that whoever it was hasn't got too much upstairs given the language used - and Debbie guesses that it could be someone from the detention centre. She asks Michael if he had any enemies and he says that his enemies would be a lot more upfront - letter writing isn't their style. Michael says it's more likely to be aimed at Debbie - someone like Louise Barker - but Debbie protests that she'd be more upfront too. Helen guesses that it might be a disgruntled customer trying to get back at Julie, which makes them all laugh. 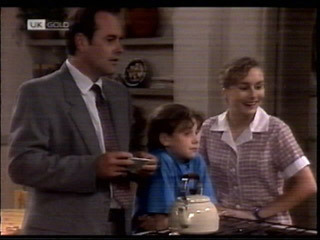 Michael and Debbie leave and Philip worries that it might be connected to the attack at Lassiters and that he and his family are under threat along with Cheryl. Cheryl's reading some instructions to a dog alarm. Brett assures her that making enemies is something that comes with being a boss and there's a knock at the door. Cheryl sets the dog alarm and warns Brett to keep quiet. She welcomes Michael in and the dog alarm sets off, making him jump. Cheryl's pleased it works. CHERYL: No, but next year's model might! Michael wants to make Wayne stay and asks Brett for his help. Debbie's trying to write Briggs' eulogy and Helen tries to help. Wayne's sorting through some papers when Michael and Brett walk in. They try a hard sales pitch with him, telling him to take back his resignation. They even get down on their knees and beg him! Wayne tells them to get back up but he'll only think about it. MICHAEL: That means he'll do it. Wayne laughs and tells them that they're both really something. The dog alarm is blaring and Cheryl acts as if there's really a dog, telling him to calm down and sit before switching it off. She opens the door and sees Philip. "Oh, it's you." She invites him in but Philip refuses, saying he'll talk outside as it won't take long. Cheryl tells him to come inside but Philip says her dog sounds rather highly strung. Rick comes in, complaining that the dog alarm has been going all night. Philip walks in, looking cautiously for a dog that might attack him - and then realises that it's just an alarm! He shows her the letter and admits that she might have been right to be so concerned. Philip says he'll do whatever it takes to keep them safe - including increasing security throughout the complex and installing a new CCTV system. Debbie's getting Hannah ready for school as Julie's away but the two argue over whether Hannah looks like a dag-o-saurus. Debbie sees that Helen's got another threatening letter and comments how freaked Philip is over them. Helen says she can't help but think that a child's done it - watch is spelt woch. Debbie says that it's either the work of a child or an idiot. Hannah looks uncomfortable as the letter's read out and Helen says she's going to show it to Philip. Hannah quickly jumps in, saying that he's already gone to work. As Helen chases after him, Debbie asks Hannah what her problem is and Hannah admits that she knows Miranda wrote the letter. Debbie says that she must tell Philip and Helen but Hannah says she can't dob her in. Debbie insists that she's got to do something and suggests that she tells Miranda to stop doing it - because if it goes on anymore, it'll be the police knocking at Miranda's door. Michael and Brett catch up with Wayne in the Coffee Shop, asking when they start training again. Wayne says he's definitely taking a break - maybe even forever - but he hasn't left them in the lurch as he's found them a new cricket coach. Wayne says he's not telling them who but with the new coach at the helm, they'll go far. Michael guesses it might be Mad Dog Morgan and reckons he'll be a shocker but Wayne says it's someone they couldn't have hoped for in their wildest dreams. They try and get more information but Wayne won't spoil the surprise. 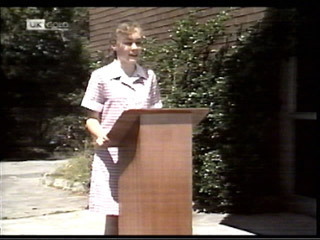 Debbie's reading her eulogy at the memorial service. She talks about her first day and remembers how Gary Briggs helped her when she started before going on about how he was a lifesaver but nobody was able to save him. Roland then continues the service and invites Mr Briggs to plant a tree in Gary's memory. He flips, telling him that a puny little tree couldn't be a tribute to his son - he wants Gary's death to stand for something. He angrily tells Roland that he doesn't understand anything and storms off. Cheryl bursts in to the office and says that Philip has to call security. Philip gets off the phone and guesses that she's talking about the guy with long hair, black t-shirt and tattoos. Cheryl wonders how he knows and Philip says it's the roadie with the heavy metal band who are staying in Lassiters! Cheryl's a bit upset that the prime suspect for their intruder turns out to be a first class guest - and asks when they're getting the new security system. Philip tells her that the bank turned them down - she's furious, saying they're an international hotel but Philip points out that the bank feels they've not had any trouble in the past so it's simply not justified. CHERYL: Do they want one of us to be killed before they do something about it? Rick and Cody congratulate Debbie on the eulogy as they leave school. In the carpark, Mr Briggs is getting Gary's car towed in - and Roland's furious. Mr Briggs insists this is what the kids need to see - what a real car crash is all about. He says that unlike the tree, the car is a reminder that will do some real good. At home, Debbie warns Hannah that if she doesn't tell them all about the letter she will. Helen walks in and tells them that she's had some good news - the police got another prank call and they traced who the culprit was. Hannah quickly makes her excuses and runs off, leaving Helen confused. She asks Debbie what's going on but all Debbie will say is that Hannah's not to blame before rushing off herself. Cheryl's ecstatic when she hears who Wayne's chosen for the new coach and when Michael and Brett walk in, she drops in the fact that he's famous. Wayne arranges to meet them at the indoor cricket pitch. Rick, Cody and Debbie discuss Mr Briggs and his actions. Cody says she thinks everyone at school should do first aid - if she'd have known what to do, she might have been able to help. Miranda and Miranda's mum visit Helen and Miranda admits to the prank calls and the letters. Helen asks what made Miranda do it - and she says it was because Hannah didn't come to her birthday party. Hannah said she didn't even get the invite and she would've loved to have been at the party. The two make up as friends before Miranda has to go to the police station. Michael and Brett are playing cricket, trying to guess who the new coach might be. Brett reckons it's just a wind up but then they spot Michael Whitney walk in. They're stunned as he greets them.